Be the first to share your favorite memory, photo or story of Giovanni. This memorial page is dedicated for family, friends and future generations to celebrate the life of their loved one. 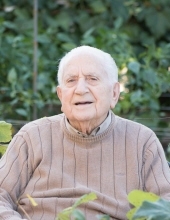 Giovanni Battista LaRuffa, 103, of Lower Gwynedd, PA, passed away on February 5, 2019. He was the beloved husband of the late Josephine (Cicció) LaRuffa. He was born in Caria, Italy on October 21, 1915 to the late Giovanni and Caterina (Staropoli) LaRuffa. Growing up in Italy, he was sent to school to become a Master Tailor. Giovanni fought in WWII for Italy and served his country as a Sgt. Major for 10 years. Upon arriving in America in 1948, he worked as a foreman at many clothing manufacturers. Giovanni also made the Senior Officer uniforms for West Point Military Academy and the Air Force Academy. Most recently, he was working at Tony LaGuda Formalwear. He enjoyed making homemade wine, gardening and going on casino trips. Most of all, he loved his grandchildren and great-grandchildren. He is survived by his daughter Cathy Neve (Captain James K. Neve, USN Ret. ); 3 grandchildren: Jim “J.J.” (Cherie), Carla (Marc), Tara (Ben); 7 great-grandchildren: Kyle, Gabrielle, Christian, Julia, Alexa, Lauren, Ashlyn. He was predeceased by 2 brothers and 3 sisters. Relatives and friends are invited to his Funeral Mass on Monday, February 11, 2019 at 10:30 AM at St. Alphonsus Church, 33 Conwell Drive, Maple Glen, PA 19002. A viewing will be held on Sunday evening from 6 PM to 8 PM at the Emil J. Ciavarelli Family Funeral Home and Crematory, 951 E. Butler Pike, Ambler, PA 19002 and again on Monday from 9:30 AM to 10:30 AM at the Church. Interment will be in Holy Sepulchre Cemetery, Cheltenham. In lieu of flowers, memorial contributions may be made to St. Jude's Children's Research Hospital, 501 St. Jude Place, Memphis, TN 38105. To send flowers or a remembrance gift to the family of Giovanni Battista LaRuffa, please visit our Tribute Store. "Email Address" would like to share the life celebration of Giovanni Battista LaRuffa. Click on the "link" to go to share a favorite memory or leave a condolence message for the family.